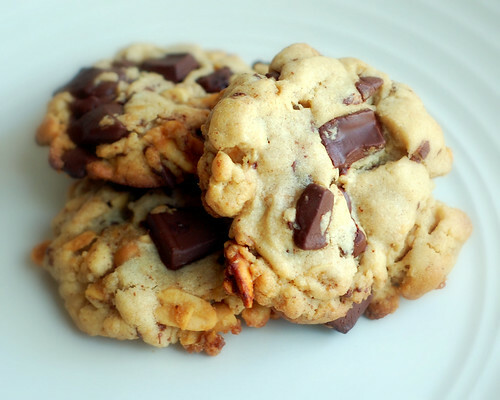 Chocolate chunk cookies made with chopped toffee-covered peanuts. Preheat oven to 350 degrees F. Line a small cookie sheet with waxed paper and grease waxed paper. Melt 1 tablespoon butter in a small saucepan over medium heat; whisk in 1/4 cup brown sugar and bring mixture to a boil, whisking frequently. Stir in peanuts until well coated, then spread out on waxed paper. Bake for 8-10 minutes or until bubbly and golden brown. Remove from oven and cool completely before crumbling into pieces. Melt remaining butter in a small saucepan over medium heat; continue to cook the butter, whisking frequently, until it starts to brown and foam, about 2-3 minutes. Set aside to cool slightly, about 8 minutes. In a medium sized mixing bowl, sift together flour, baking soda and salt; stir in yeast until combined. Roll heaping tablespoonfuls of dough into balls, place on greased cookie sheets and flatten slightly using palms of hands. Bake for 11-13 minutes, or until golden brown around edges. Cool 1 minute before transferring to wire racks. 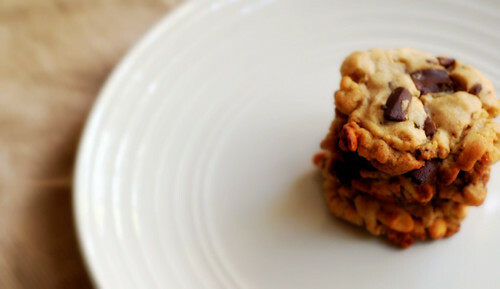 22 comments on "Peanut Butter Chocolate Chunk Cookies with Toffee Peanuts"
Amazing goodies...I would love for this to be a yearly tradition. WOW! These look good. I was wondering what to make tonight for Labor Day dessert! Thanks! Happy labor-free day! Yummmy yummy, these look divine! oh so good :) i surely can t resist these. Sorry you are working today. What exactly is wrong with those pictures? They look great to me. Oh, and the cookies do too! I love seeing all the different choco chip cookie variations. I think the pics look great :). 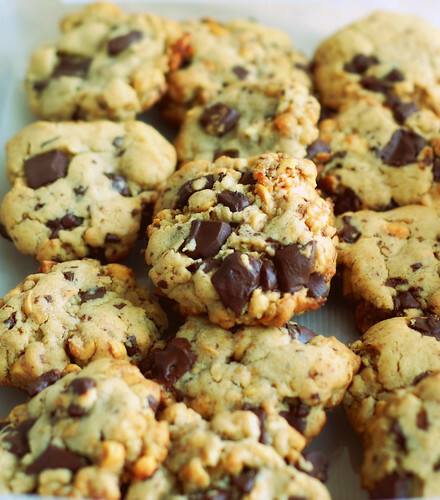 I am in love with those cookies..
they look way better than the healthy ones I made recently. And I am still laughing at your comment about the meth addict in the Asian Food section in Walmart. I just noticed you used yeast in the cookies... why? for lift or flavor? I have never seen yeast used in cookies before. You are so innovative! Well, I think the pictures are great! And all you have to do is mention "toffee" and I come running! I LOVE the toffee peanuts in these, what a great idea! I made and posted about your killer cake. My pictures don't do yours a bit of justice, but dadgum, it sure tasted GREAT! those are some marvelously chunked cookies, emily. i prefer my chunks be made of either chocolate or toffee, so these are win-win. Phwoar - you have me with the toffee peanuts! Delicious!!!! ha your "bad" pictures are anything but bad. these look delicious!!! Peanut Butter, Toffee, Chocolate - these cannot sound or look any better. These look almost like chocolate chunk cookie balls! Yum! OK! They were SOO good! My husband loved them! He could smell the peanuts, which he gets crazy when he has them in a dish. Thanks Emily! These make me want to be less lazy about cookie making. This is way late, but I'll explain. This big woman in Wal-Mart said I was in her way and I needed to learn some etiquette. Blah blah blah. She started yelling at Eric and me. It was all stupid.